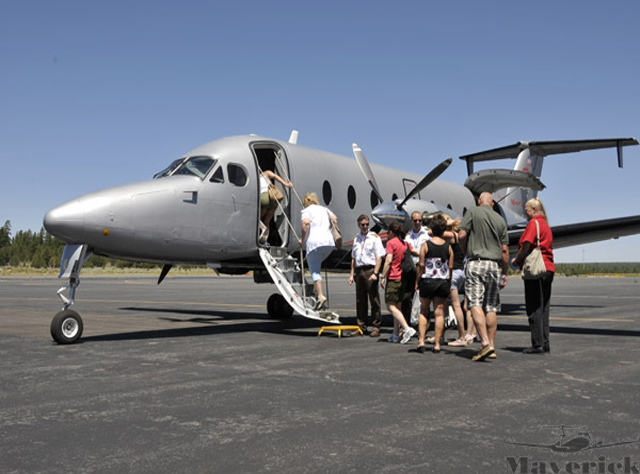 Your ultimate excursion begins with a 40-minute flight to the Grand Canyon's South Rim aboard a Beechcraft 1900D aircraft. Your journey continues with ground transportation into the Grand Canyon National Park to enjoy the awe-inspiring vistas, panoramic overlooks and trails that can only be accessed from inside the park. You’ll enjoy exploring the historic Bright Angel Lodge, built in 1935, and Mather Point, which boasts some of the most inspiring views of the canyon. A gourmet box lunch will be served as you absorb the magnificence of the Grand Canyon and capture memories of a lifetime. Duration: approximately 7.5 hours (hotel to hotel). Departure Point: Maverick's terminal at the Henderson Executive Airport (tour includes complimentary transportation to and from hotels within five miles of the Strip).